Reston, Va., April 1, 2010 (PRNewswired) — The Reston Association has announced an agreement in principle with Restonian Worldwide Blog and Plastic Extrusion Manufacturing Inc. to purchase all intellectual property associated with “Restonian.org,” a Web blog that provides news about Virginia’s premiere community to Live, Work and Play (tm). Purchase terms were not disclosed. 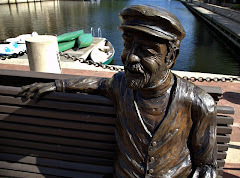 The Reston Association is planning a variety of new features and enhancements to the Web blog, including a 24-hour live Webcam of the statue of Reston founder Robert E. Simon at the architecturally renowned Lake Anne Village Center, an interactive response form to report neighbors’ Design Review Board violations, official campaign slates, and a full Pantone-certified palette of approved trim colors. Restonian founder and CEO Earl Hoffert -- who had remained anonymous until the acquisition was made public -- was unavailable for comment, but said in a statement that he is moving to the planned community of Columbia, Maryland, where he will start a new Web blog entitled “Columbian” with the proceeds from the acquisition, which are believed to be in the low two figures, as well as amnesty from 20-plus years of covenant violations. “Get that damn microphone out of my face,” Hoffert told reporters congregating around Restonian World Headquarters Thursday morning. RA President Robin Myers emphasizes the site’s ability to enhance two way communications with Reston residents, through an advanced commenting system which will be monitored 24 hours a day by Reston Association convenant specialists. “Our new Web blog presence on the Internet’s World Wide Web will focus on positive news, much like that which is shared by ‘professional journalists,’” she said. Are you sure this is a joke? I'll bet this "web log" is a lot cheaper to put out than a glossy magazine. OMG, you had me for a few seconds. Totally worth it. Nice one! My husband skimmed through this press release three times for a good two minutes before realizing the joke. Thanks for the midnight giggles Restonian! I thought I'd clicked on the wrong bookmark. Had me going. Was about to say: Well wel! Hilarious! That was a great laugh! "Matthew Milton" -- At least you didn't misquote the CEO Milton Matthews! Hey, Earl. You don't have a brother named Vern do you? Brilliant. I nearly screamed in horror as the page downloaded and I saw She Who Must be Obeyed and her Website gracing my monitor. You had me - did a couple of double takes before cracking up! Ha Ha. That was awesome! Little robin must be spinning her head exorcist style. I just went to the RA Website to see if, in the spirit of this day, they had reciprocated and featured this filthy Weblog on their home page. Oh, come on Peasant. Don't act surprised. If they had done something like that people would rant about how it was a waste of funds and not how the dues should be spent. Catch-22. Also, BiCO -- AHCW is a bit harder to say. :( Actually, would it most accurately be pronounced 'ach-ew?' Like a sneeze? That comment of mine is what is know as tongue-in-cheek. Doh. I noticed you posted it at exactly 12 a.m.--nice touch! And did you hear that RA has financed a plan to genetically engineer the deer to eat ONLY non-native invasive species plants? That way, they'll do our dirty work for us, and when they've consumed all the bad plants, they'll lay down and ... quietly expire. I wish. April Fool's indeed. Can you even imagine ---- then the fat chick with the bad haircut and an even worse dye-job would be able to persecute like never before.